Don’t lay landscaping fabric on the ground then apply mulch on top of it. After stapling it all down, from the back of her van day after day came bag after bag of shredded wood mulch, which she distributed on top of the fabric and around all the plants. I didn’t like the color, too light, but she did a nice job with that, spreading it out with her pitchfork in a uniform four-inch thick layer throughout the various beds. The entire time, I bit my tongue. It was none of my business, and we had work to do. I’m getting soft in my old age. What she didn’t realize was that the landscape fabric was an unnecessary component to the project, and will cause more harm than good. She figured that the landscape fabric (or weed barrier, as it is also called) would keep weed seeds from germinating in the soil and growing up through the wood mulch. Well, the hefty four-inch layer of shredded wood mulch she had laid on top of the fabric will accomplish that. 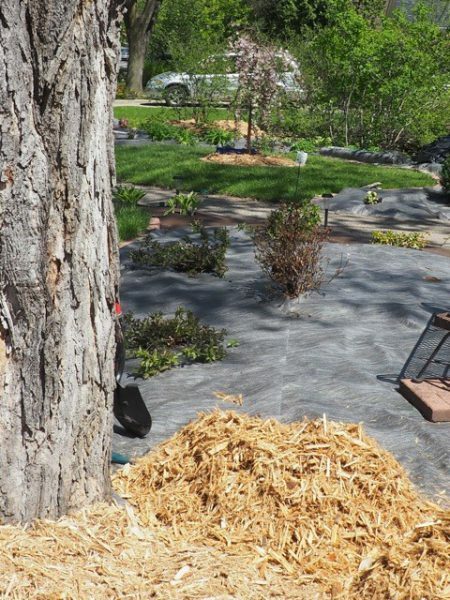 Just three inches of shredded wood mulch will entirely block out the sun’s rays and keep the soil temperatures down so that any weeds seeds will not activate and grow. The detrimental effects of the superfluous weed barrier fabric under the mulch are many. Studies show that though advertised as porous, landscape fabric doesn’t allow either rainfall or oxygen to enter soil at the same rate as it would were the fabric not there. In fact, it can cut the rates in half. Water flows to the lowest point, meaning that the slight rises, dips and swales in the contour of her yard will cause water to pool and soak in over there, but not around plants growing on any kind of slope. In heavy rains, water will pool atop the fabric, and float the wood mulch for a few inches to several feet. And you’re going to get weeds. A majority of the weeds that you will spot growing in your garden beds are wind-blown. They nestle down into the mulch, get moist, and sprout. The fact that there is a layer of plastic beneath the mulch is hardly going to stop that. You pull them when you see them, seven weeds per day. Catch them early and they can be plucked with little effort. Most important, the fabric stops the organic mulch from achieving the most important role to which is has been assigned: breaking down into organic matter after three to four seasons and being absorbed into the soil, thus adding nutrients and improving soil texture.